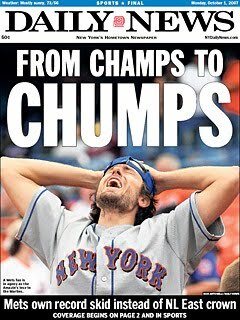 It's only yesterday that this was the story of the Mets, is it the story of the Phillies now? The Mets win was interesting last night. It appeared that the Phillies would go on to victory as their closer, Jonathan Papelbon, took the mound and went out to do what the Phillies paid him $50M dollars to do. The Mets wouldn't hear of that last night. The Phils pulled out some offensive rally last night, especially Jimmy Rollins, came through for the Phils when the team needed him to. Rollins swatted an RBI triple last night in the 6th inning, and scored Cole Hamels to tie the game up 4-4. The Phillies gained the lead 5-4 as we fast forward to the bottom of the ninth, David Murphy smacked a ball off of Jonathan Papelbon, as he ran down to first, and no play could be made on that by Papelbon. Papelbon had given up and earlier hit by pitcher and a walk so the Mets tied the game on that Murphy ding off of Papelbon. David Wright then strolled up and dropped a bloop single into shallow right field as Hunter Pence was not able to get there to catch it. Phillies lose, and Papelbon claimed responsibility. When it is going bad, it just is going bad. The Phillies know a little about bad this season. Papelbon has a curious breakdown on some of his numbers so far on the season. On the road, Pap is sporting a 1.23 ERA, but at home in Philly, he is a baloony 5.40 with a 2-2 record and opponents are batting .290 against him. Rumors are that Ryan Howard may return to the Phillies this weekend, just in time for the 100+ degrees forecast for Saturday maybe? Chase Utley's return was great, he started off with a bang for the Phillies but since his return the Phillies haven't really returned to their winning ways. Utley's first 7 games since he's come back to the lineup have him at a .307 BA though, and he already has 2 HR and 3 RBI on the season. It's obvious that the Phillies are starting to play better with him on the field. Are the Phillies still capable of pulling this together when Howard and Halladay return? The Phillies are a full 13 GB and still in last place as people still are scratching their heads and wondering how this is possible. Oh, the Atlanta Braves are coming to town for a 3 game series starting tonight at CBP, then the All-Star break in which only a couple of Phillies will take part in takes place. Again, who would have thought hardly any Phillies would be at the All-Star game this year? Cole Hamels, Jonathan Papelbon, and Carlos Ruiz will make the appearances for the Phillies at this year's All-Star game in Kansas City which is played on Tuesday night.